Kimberly Dozier is a CNN Global Affairs Analyst and ​has contributed to The Daily Beast​ since 2014. She served as​​ ​executive editor of the intelligence-focused online startup TheCipherBrief.com from fall 2018 to the spring of 2018. She covered intelligence and national security for The Associated Press and from 2010 to ​2014, after 17 years as an award-winning CBS News foreign and national security correspondent. Dozier held the 2014-2015 Gen. Omar Bradley Chair at the U.S. Army War College, Penn State Law and Dickinson College—the first journalist and first woman in that post, where the chair holds seminars sharing lessons from their career. Dozier covered the war in Iraq for CBS News from 2003, until she was wounded in a car bombing in 2006. That bombing killed the U.S. Army officer her team was filming—Capt. James Alex Funkhouser, along with his Iraqi translator “Sam,” and Dozier’s colleagues CBS cameraman Paul Douglas and soundman James Brolan. 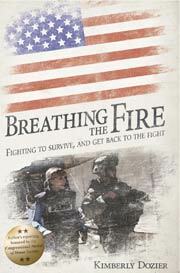 In best-selling memoir, Breathing the Fire: Fighting to Survive and Get Back to the Fight, Dozier recounts the attack and journey to recovery, thanks to the troops on the ground and an army of medical professionals who took her from learning to walk again to running road races—pain- and post-traumatic-stress free. The author’s proceeds from the paperback and e-book have gone to charities for the combat-injured like Fisher House. Dozier has also used fees from speaking to national security forums to donate the paperback to patients and families going through the same medical crisis. Dozier speaks on issues ranging from U.S. counterterrorism and national security policy to her own story of survival and recovery, as well as sharing lessons on the role of the media and national security. Watch Dozier flying with the Golden Knights.